We've taken all the guesswork out of installation. 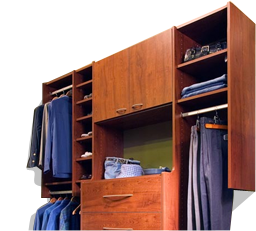 Here you can find an overview of the installation process, watch a video on how to install your closet system, and download our fully illustrated and comprehensive installation guide. If you still need help, just contact us! 83 7/8” is the recommended fixing rail height (or otherwise noted on your design). Using a tape measure, measure 83 7/8” from the floor up the wall and make a mark at each corner as well as the middle of the wall. Locate your studs on your wall. You can do this by using an stud finder or with a nail and hammer. Studs are usually located either 16” or 24” apart on center. Next hold the rail so the bottom edge is on the 83 7/8” mark or using other noted measurements. Using the 2 1/2” screws provided, attach the rail to a stud in the center of the wall. Next use your level and level off the rail. When that is done screw in the reaming screws in each stud. For use of togglers refer to the instruction manual. Each side is labeled above the hanging bracket for the closet wall and sequential location according to the design. After you have separated your side panels in order you will begin the hanging process from left to right (clockwise). Hang the first side on the rail; make sure that the lip on the camar hanging bracket is placed behind the lip on the rail. Hang the next side on the rail using the approximate length of the fixed shelf for the section, which allows the top fixed shelf to be locked into place. The fixed shelves will have VB cam fittings facing down for ease of access and strength. Using a Philips screwdriver, insert the screw driver into the VB cam and turn it clockwise ¾ of a full rotation. For a closet organizer that has drawers, the shelves on the bottom and in between drawers can be turned over to access the VB cams from the top. Position your drawer into place by lowering the face end down and setting the back drawer roller over the side roller. Then lift the drawer face upwards and push it closed. For baskets join outer slide together with the inner slide (already installed). Hang the basket using the “second rim” to the slide. Then install the rubber stoppers to stop the basket from being dislodged. All shelves are adjustable unless they are fixed shelves. Adjustable shelves have four pins used to support the shelf. You can place these adjustable shelves anywhere there are system holes. To place the hanging tubes, locate the tube support brackets first. The supports should be placed one hole down under the fixed shelf and in the front hole pattern. Then you can slide the tube into place.